The world of internet is stormed with a multitude of hackers who are prying over valuable users’ information. We enter a website, share our personal details and login credentials to sign up, but do we really know if the information that we have entered is safe and secure over the web. The ever-evolving threats online can be dealt by the hackers to manipulate and gain access to our personal information like bank account details, social security number and all that is supposed to be confidential. Attackers develop and implement new and various sophisticated techniques to inject malware into the website code. There are online malware scanning tools that enable us to scan websites and check for any malware presence. The website scanning tool entitles the website owners to understand the presence of malware and helps to take necessary actions against them and remove them instantly. Quttera is yet another effective tool that provides free malware scanning of your WordPress, Joomla, Bulletin, Drupal, and Sharepoint website. It also provides a report in detail about the malicious files, suspicious files, external links detected, blacklisted status, clean files and so on. Quttera also offers service to remove malware if the website is already infected with malware and enables blacklist removal as well. SUCURI comes third in the line, with its own set of comprehensive security scanning features. The malware removal tool from Sucuri helps to perform scans for websites of any platform that includes Joomla, Magento, WordPress, etc. The website scan is carried out to check for malware at no cost with a list of the following information. Google Safe Browsing is yet another malware scanning tool that tops the list to check if the webpage is infected with malware and phishing content. Malware scanning is simple and easy, all you have to do is to copy and paste the URL and in just a single click you will know if the website is infected or not. Last but not the least is MalCare Malware Scanning Tool has been known to be trusted by more than 20,000 WordPress site. Its features malware detection, protection and complete clean-up of the malware detected. It deploys over 100 signals to check if the website is infected with malware be it simple or complex. With just one-click, it assures malware removal and consistent protection. It is certain that no malware scanning tool proves to be 100% right. 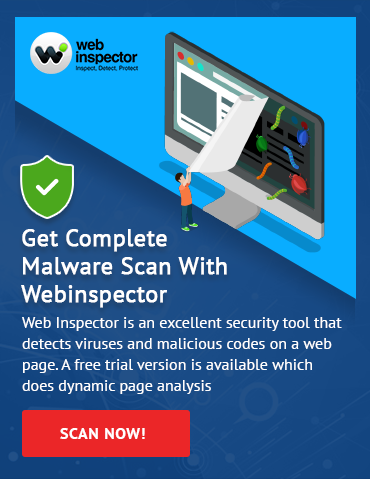 Howevr, If you are considering to use a malware scanning tool, Comodo Webinspector is the best malware scanning tool that assures Hacked website repair and website malware removal to protect and fix infected websites from the possible cyber threats.